The Scriptorian | A photoscriptorian blog by Steampunkaneers for all things Steampunk in Second Life. 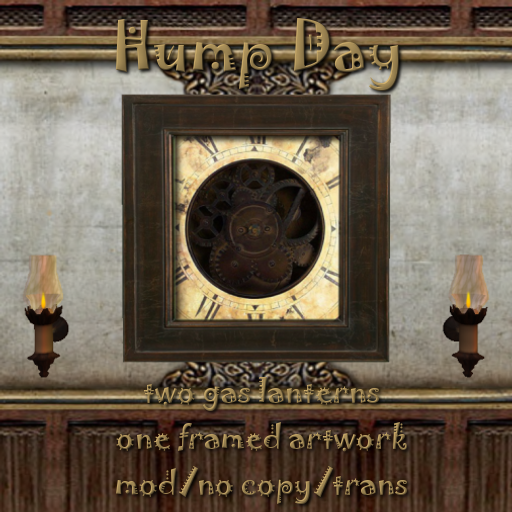 A photoscriptorian blog by Steampunkaneers for all things Steampunk in Second Life. 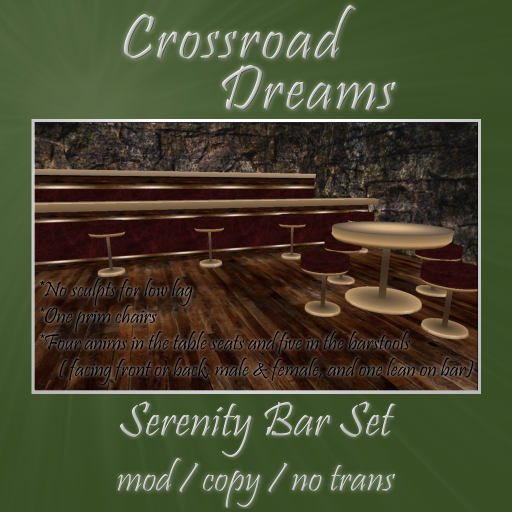 The Serenity Bar set is a Steampunk-inspired bar designed specifically for role play. The set uses no sculpts and carefully applied textures to keep it as low lag and low prim as possible without skimping on richness and attention to detail. And for today only it is available for L$69! The bar stools are each only one prim with animations thoughtfully chosen for role play with four animations in the ones around the table (one facing the table and one facing away for each male and female) and five at the bar (an additional stand leaning back against the bar pose). The table is also a single prim. The bar is four prims and is set to 10 meters long but very easily modified to fit smaller spaces. The table and chairs are linked as are the bar and stools for easy set up but can be unlinked without worrying about loosing track of prims. The entire set is copy/mod/no transfer, making it perfect for even larger role play spaces and events where more than one table or length of bar would be useful. The Artemus armchair is part of the Artemus steampunk living room set. The armchair is available in five colors for a variety of options. This one is not texture change scripted as steampunk areas tend to be so heavily scripted to begin with and I wished to save a bit on the lag factor. The armchair is mod/copy but available in vendors for gifting. The armchair has a very special series of five couple animations including three brand new ones. You can sit together for a quiet evening, offer a relaxing footrub… and receive appreciation for your thoughtfulness. The menu driven couple poses are accessible by touching the metal base of the chair. The armchair also has four individual poses in the seat cushion. 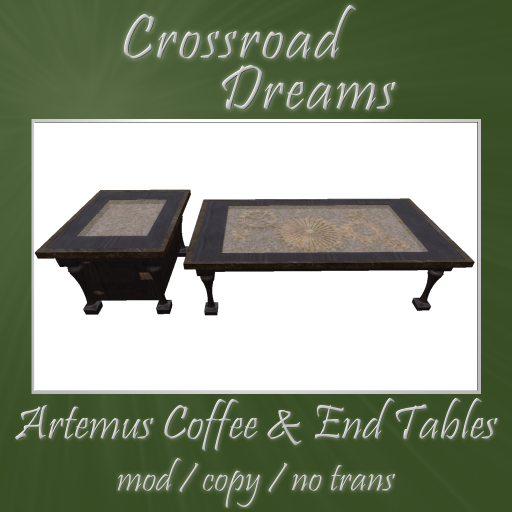 The Artemus coffee table is no ordinary coffee table. You will not want to hide this piece under books and knickknacks. You’ll find displayed within this sleek wood and brass table a series of elegant, fully mechanized clockworks. Accented by the series signature gold-inlaid glass, this mesmerizing display will definitely attract attention and admiration. The matching end table is crafted of the same elegant wood, brass and glass combination. It includes a cabinet with sturdy brass-latched doors on either side allowing safe, convenient storage to keep items near at hand. For today only, this set is available at the Hump Day introductory price of L$69. Don’t miss your chance to own the latest pieces of the Artemus set at this great price! Also, for those who have purchased one of the new Artemus sofas, I have set out a series of five rugs perfectly coordinated to match the sofa colors. At L$50 each they are a steal and a great, easy way to coordinate your decor. It’s here! Finally the Artemus steampunk furniture set is being released! The first piece, the Artemus lamp, was the hunt prize for the STEAM hunt and I had hoped to release the rest of the set during the hunt but SL has been most uncooperative. 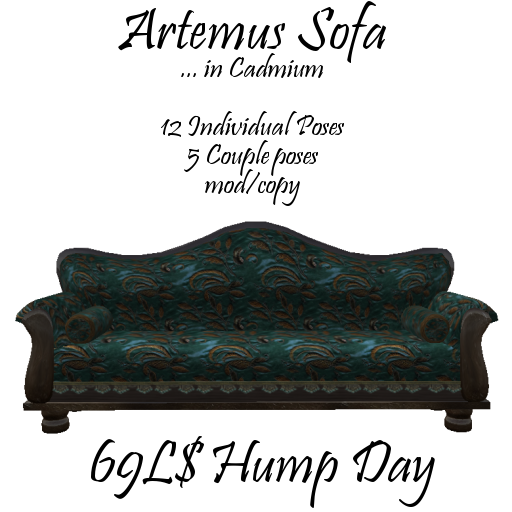 Finally the next piece, the Artemus sofa, has been set out as today’s Hump Day item. The sofa is available in five colors for a variety of options. This one is not texture change scripted as steampunk areas tend to be so heavily scripted to begin with and I wished to save a bit on the lag factor. Consequently the price will be somewhat less than most in the shop but why wait when you can get it for such a great price today? The sofa is 18 prims and mod/copy but I’ve put it in a vendor for gifting. I’m using a new script system for my individual seating poses that allows me to put multiple poses in one prim so no more hunting for all the fun poses! The scripts also allow each avatar to adjust the position of the poses and will remember that position the next time they sit. The sofa has a total of 12 individual poses, four in each of three cushions, and five couple poses in a menu-driven system. I will be releasing an amazing animated coffee table and matching end table for Hump Day next week and a very special matching armchair the following week so keep your eyes open to collect the set at these great prices! Here we are again, halfway to the weekend and ready for some Hump Day Happiness. I have been enjoying my adventures in steampunk creation and have two new items in this line for you this week with several more in progress. Salvaged clockwork pieces and an antique leather frame come together for a unique, original piece of artwork to grace your steampunk-themed room. Sit back and admire your new treasure, lit by the warm glow of gas flames diffused through the handsome, hand-blown gold glass of refurbished gas lanterns. Artwork is one prim and lanterns are two prims and touch scripted. The artwork is mod/trans for L$50 and the lanterns are available mod/trans for L$75 or mod/copy for L$200. But from now until Wednesday midnight (or a bit later since I am asleep at that hour) you can purchase the artwork and two trans gas lanterns as a set for L$69. Don’t miss your chance to grab these and other wonderful discounted items from participating vendors and have a very Happy Hump Day! I want to say thank you to Buckaroo Benoir for all of his help with names and ideas for the group, including his own creation of a new word… photoscriptorian.